2012 Triumph Bonneville. Picture credits - Triumph. Submit more pictures. Built in the spirit of the all-conquering British twins that ruled the roads in the 1960s, the modern day Bonnevilles uniquely combine up-to-date design and manufacturing methods with traditional styling and attitude. Color options: Phantom Black. Crystal White. Gold. Ask questions Join the 12 Triumph Bonneville discussion group or the general Triumph discussion group. Click here to sell a used 2012 Triumph Bonneville or advertise any other MC for sale. 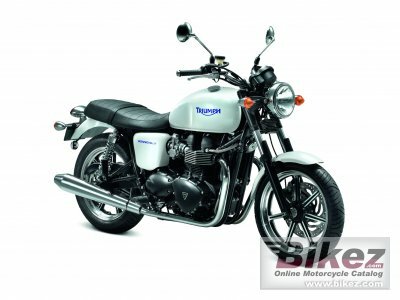 You can list all available Triumph Bonneville bikes and also sign up for e-mail notification when such motorcycles are advertised in the future. Ads with or without pictures are easy to create. Our classifieds are completely free with sections for every country in the world. You can also check out our list of related motorbikes. Compare technical data. Look at photos. View your fellow riders' rating of the bike's reliability, design, engine performance, accident risk, repair cost, etc.